By 2035, all new car sales must be zero emission vehicles if we intend to meet the European Union’s goal to reduce greenhouse gas (GHG) emissions by 80-95 % by 20501. During 2017, the market share of alternative fuel vehicles registered in Europe reached only 1.4%2. In the UK, the corresponding market share accounted for 4.7%3 of total registered cars. A fundamental and fast change within the road transportation sector is required if Europe wants to achieve its objective of a long-term transition to a low-carbon economy. The transport sector is responsible for around a quarter of the total GHG emissions in Europe, directly contributing to climate change. It is also a key factor in the current high concentrations of air pollutants in many European cities, which increasingly fail to meet air quality standards set by the EU and the World Health Organization (WHO). London has five of the most polluted streets in Europe, with estimates accounting for 40,000 premature deaths directly linked to illegal air pollution levels in the country4. Regardless of these figures, the UK government has consistently failed to meet its obligations to improve transportation-related air quality. It is important to understand that switching to electric vehicles (EVs) is only one part of the puzzle. If we intend to move towards a sustainable transportation ecosystem, the entire energy system must undergo deep transformational change. It is expected that the whole European EV market demands an additional electrical capacity of 150 GW by 2050, which is equivalent to constructing more than 100 new Sizewell B nuclear power stations. This poses a bigger question; what kind of additional sources will be used to generate this additional electricity needed to power EVs? Coupling renewable energy sources and electric vehicles may be a good starting point. Implementing more connections between solar photovoltaic (PV) energy and EVs could help to bring about considerable decarbonisation for the future road transport sector, along with the co-benefits of improved resource efficiency and reduced air pollution. With Tesla leading the way, pledges from prominent passenger vehicle manufacturers such as Volvo and Jaguar Land Rover to electrify their entire vehicle lines by 2019 and 2020, respectively, have boosted the popularity of EVs through their brand value. More importantly, the commitment from Tesla and others has begun to bring about the needed cost reductions to make EVs affordable to a wider consumer base. As a result, the demand for fitting EV charging points in homes, businesses and along motorways has skyrocketed. The European Alternative Fuels Observatory estimates that currently more than 118,130 charging connectors are deployed across Europe5, with the number expected to increase rapidly. Workplaces, retail centres, councils and local communities are increasingly installing charging points in car parks and various public spaces. One area that Longevity Partners has been exploring is the potential synergy between solar carports and EVs. Solar carports are solar canopies that sit above car parking spaces, typically at ground level but also on multi-storey car parks. Siting the two together allows EV chargers to utilise the electrical infrastructure of the solar carport, reducing installation costs. Furthermore, when coupled with electricity storage they can negate the need for substantial grid upgrades. Without electricity storage the deployment of EV charging points at scale can necessitate costly grid reinforcements, sometimes in excess of one million pounds. 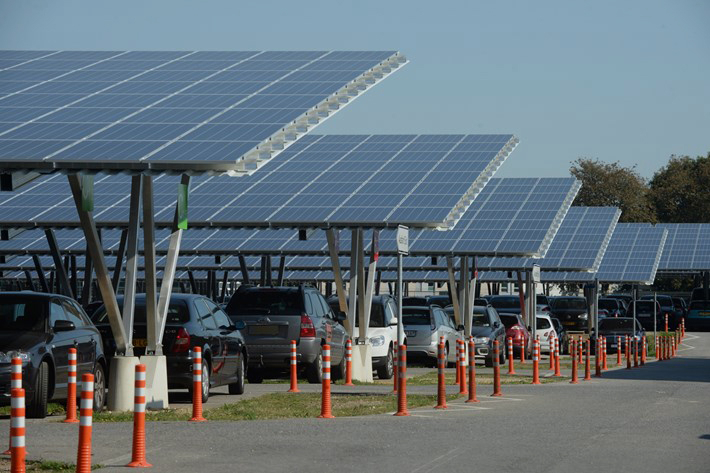 As well as charging EVs, solar carports come with the same benefits as rooftop mounted solar installations, generating electricity to be consumed onsite or sold back to the grid, while benefitting from government subsidies (depending on the jurisdiction). They provide a boost to companies’ corporate responsibility agendas while ultimately contributing to ongoing GHG emission reduction targets. Their presence can make a big contribution to scores received for green building certification schemes such as LEED and BREEAM. A carport system will typically take longer to recover its capital costs than roof-mounted solar PV. Large installations will have lower fixed costs, but even so, there has been reluctance to implement these systems at scale. Carport installations are, however, gaining traction in the UK, with a number of projects currently underway. For example, Longevity Partners are assisting Hammerson, a leading retail property investor and developer, to deploy carport facilities at a number of their retail centres in the UK with several future plans being developed in parallel. In the next decade, EV fleets alongside a combination of smart charging and vehicle-to-grid (V2G) technologies will allow electric vehicles to become central in the storage of electricity generated from renewable energy sources. The coming years will demonstrate just how far and how quickly the sector develops.